This is a fantastic side or starter and great for any vegetarians. Preheat the oven to 200°C/400°F/ Gas Mark 6. Cook the rice as per pack instructions until just tender. Drain to remove excess liquid then return to the pan. In a separate saucepan cook the sweet corn until tender, then remove any excess water from the pan. Meanwhile, remove the top off each pepper to make the lids. Using a spoon remove the seeds from each pepper then place the peppers and cherry tomatoes in a large ovenproof dish or roasting tin. Drizzle the peppers and tomatoes with olive oil and bake for 10 minutes. 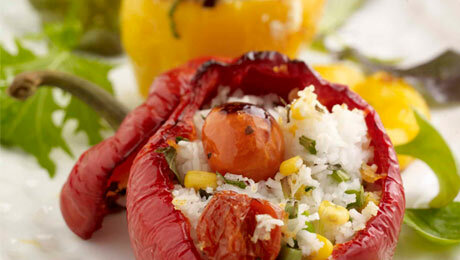 In a bowl, mix the rice, cooked cherry tomatoes, spring onions, paprika, olive oil, vinegar, chives and seasoning. Spoon roughly a dessertspoonful of the rice and vegetables into each pepper. Serve with some baby salad leaves.